The mandala in post #37 is done on canvas stretched on a frame, covered with white acrylic paint. Then the design was drawn with a fine point sharpie. 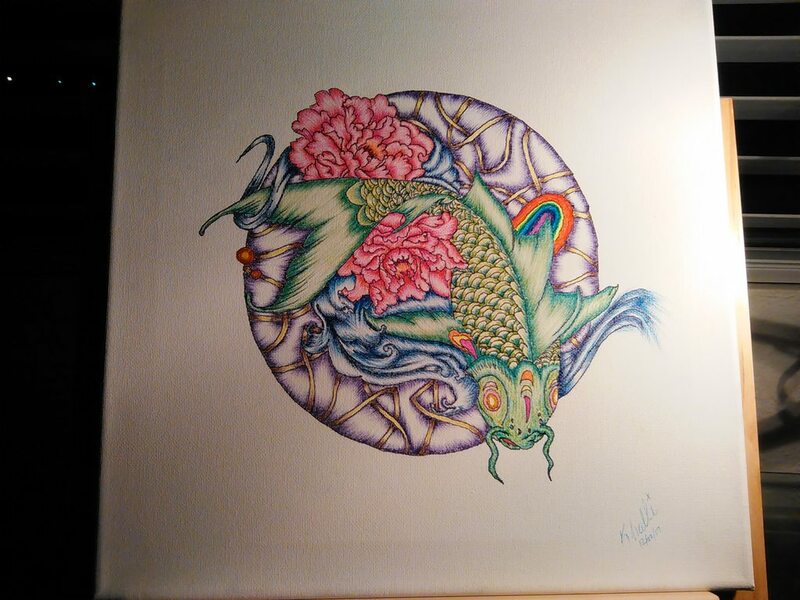 The gel pens took almost 4 days to fully dry on it. I need a better camera as the colors are amazing in person. Rely upon yourself, be independent, and live your life being humble and grateful for all lessons and blessings. Live simply, walk humbly, Love genuinely and all good will come back to you! I call this one "Nalu it". Awesome, this feels so real. So detailed. Very nice, your art has improved. Too good ! Oh, so very pretty. I really like it! "The Children of God were moulded by the Hand of God which is called Awen..."
Or speak to the earth, and it shall teach thee: and the fishes of the sea shall declare unto thee." What a beautiful work! Thanks for sharing it! wow you are so amazing! :o I haven't looked at all of this. Just the first page and I am already fascinated. Be you and nobody else because you are special.